Have you been affected by environmental pollution? A Minnesota Pollution Control Agency research scientist told a Senate environment committee Tuesday her bosses have repeatedly blocked her work studying chemicals once manufactured by 3M. The chemicals have been found widely in the blood of humans and animals, and were recently discovered in wells in the east metro area. MPCA officials denied they are hampering the research. But committee members were skeptical, and angry the MPCA's commissioner did not attend the hearing. St. Paul, Minn. — Fardin Oliaei is the scientist at the center of the MPCA dispute. As the agency's emerging contaminates coordinator, Oliaei studies substances like perfluorinated chemicals or PFCs -- the material that 3M used in a variety of stain and water-resistant products, including Scotchgard. 3M announced five years ago that it would stop making the chemicals, after the company discovered they were turning up in the blood of humans and animals throughout the world. The phaseout was completed in 2002. But the chemicals don't go away easily. They persist in the environment for many years. Recently, unsafe levels of PFCs have been found in private drinking water wells near sites where 3M once disposed of its production waste. Oliaei began looking for PFCs in 2002, shortly after 3M told the MPCA it had discovered PFC contamination on its own property. Oliaei told Senate committee members her research showed that PFC contamination was a serious problem. But she said her MPCA bosses did not want her to move forward with more research. "I have found that at every turn, this MPCA management has tried to hinder my work in investigating the PFC problem," Oliaei said. "The managers became totally blind of their professional obligation." Oliaei told the committee she made numerous requests for research grants that were repeatedly rejected. Finally, she said she arranged a personal meeting with Commissioner Sheryl Corrigan to plead for more support and funding. "In that meeting Commissioner Corrigan told me that she would get back to me, but she never did," said Oliaei. 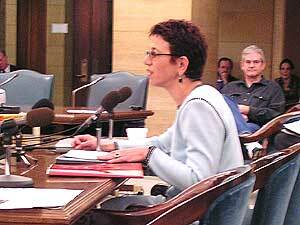 "At my meeting with her she did, however, say to me that the MPCA is not a place for scientists. It is not a research institution. And I should look for another job." "She ought to be here"
Oliaei has been vocal in her criticisms of the way the MPCA has handled the PFC issue. In early 2005, she agreed to be interviewed by Minnesota Public Radio news, which investigated the agency's response to the chemicals. "During the interview at MPCA offices I was surrounded by my manager and supervisor like two bodyguards, during which my manager just glared at me and my supervisor vigorously took notes," said Oliaei. "After the MPR program was aired I was given a written reprimand, apparently for dishonoring my colleagues and some misstatements that have never been explained to me." Oliaei's testimony got a boost from MPCA colleague Don Kriens. He's an engineer who has worked closely with the scientist on water quality testing. He told the committee that Oliaei is passionate about her work, often putting in 14-hour days and even using vacation time and her own money to fund her research. The committee chairman, Sen. John Marty, then asked Kriens if he thought Dr. Oliaei has been treated unfairly on this issue. "It's difficult. That's a hard one for me. So it's hard to come here and be able to say things about that, because it puts me in a tough spot, to be honest. So I'm a little hesitant," said Kriens. "But I'm going to go ahead. I do think she's been treated unfairly. Yes," Kriens told the committee. "I think her reprimand was wrong. I don't see any foundation for it. I don't see misstatements. I know about the issues. So I guess the short answer is yes. I think she's been treated unfairly." After Oliaei was disciplined for talking to MPR, she filed a whistleblower lawsuit against the agency and Commissioner Sheryl Corrigan. Many committee members were angry that Corrigan did not show up for the hearing. Corrigan is a former 3M employee. Deputy Commissioner Kristin Applegate appeared on her behalf and told the committee that Corrigan has recused herself from matters regarding 3M. That reply angered Sen. Satveer Chaudhary. "Did she think that her prior position at 3M would be felt -- that the committee would feel that would be at all relevant to this issue and that she ought to be here?" Chaudhary said. Applegate replied that she couldn't answer a hypothetical question. Chaudhary then asked her where the commissioner was. "She was attending our Citizen's Board meeting today," said Applegate. "I just think that's, at best, rude," Chaudhary responded. "I think it's, at worst, a real shirking of what this committee is here to investigate -- oversight of an agency. And the commissioner ought to be here." She's been doing work that a company doesn't like, certain senior managers don't like, and they're treating her like dirt. Chaudhary suggested the committee should hold another hearing on the issue and require that Corrigan testify. Applegate did use her time to talk about what the MPCA has done about the PFC issue. She said because of Oliaei's whistleblower lawsuit, she couldn't specifically address the MPCA's treatment of the scientist. But she did say the MPCA has taken the PFC issue seriously. Applegate said in early 2002, the agency decided to focus its resources on studying the sites where PFCs were disposed and figuring out which water supplies had been contaminated. "I will tell you that I have complete confidence that on this project I'm proud of the work that has been accomplished. I think it has been comprehensive," said Applegate. "I think that as we learned of the issue and became of aware of a site that was affected, the action was very fast in terms of cooperation with (the Minnesota Department of) Health, in terms of finding the other sites that might be impacted, in terms of working with residents and local communities to make sure that we have systems in place to make sure that the issue was addressed," Applegate said. "And so I'm feeling very confident about the agency's work on this project." Applegate also said the agency has had to balance its work on PFCs with other important priorities that involve other kinds of pollution. Committee chair Sen. Marty said he will have at least one more hearing on this issue. He said lawmakers still want to know just how pervasive the PFC chemical problem is in Minnesota. But he acknowledged the committee can't do much more than bring pressure on the agency to change the way it treats employees like Fardin Oliaei. "It's clearly retaliation to me," said Marty. "She's been doing work that a company doesn't like, certain senior managers don't like, and they're treating her like dirt. And there's no excuse for that. So I'm hoping that the public pressure and that the attention to this gets them to clean up their act." Marty said he'd like to schedule another hearing on the matter sometime in November.